Members: Sakurai Kazutoshi (vocals, guitar), Tahara Kenichi (guitar), Nakagawa Keisuke (bass), Suzuki Hideya (drums). 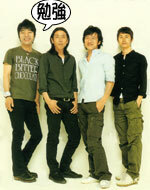 Kouguchi Shuuji (guitar) and Ura Kiyohide (keyboard) are regularly used support members for Mr. Children. Singer Sakurai has also been involved in a cover band project called Bank Band, with producer Kobayashi Takeshi on keyboards and Sakurai on vocals.